That is awesome - looking forward to seeing some results! Will this be laptop compatible? Congratulations! I really hope you'll succeed in making this a reality, it will open a whole new area of research/hacking to a lot of people. Yes, it will work with a laptop. In fact, a laptop (or other general purpose computer with a fast CPU) will be required to do much of anything. We will work on providing an interface to GNU Radio. If you are disappointed by how far I've been able to develop Ubertooth software over the past year, believe me: you are not half as disappointed as I am. This is about to change in a big way. I'll be making an exciting announcment about Ubertooth development within the next couple weeks. I'm using the RFFC5071 on Lollipop. I am also entertaining an alternative design called Bubblegum that uses PE4140 mixers plus a VCO/PLL such as the TRF3765 or ADF4530. Thanks, Alexander! Lime was not helpful when I contacted them several months ago. I'm glad you had better luck! Keep up the good work! Many are following behind. Maybe someday we will altogether build our own mobile network complete with base stations and access network. Who knows! When your receiver is on and your transmitter is off, no signal is being transmitted, therefore your receiver is open to pick up any transmitted signal. Really looking forward to this, and I'll definitely have to pick one up. Keep up the awesome work! where's the big announcement on ubertooth one development? We still do not have a basic element to make the platform useful: frequency hopping. Without that the Ubertooth is an expensive piece of junk which I and others wasted money on. So no new projects until we see some value in our previous investment. Does 20MSPS give you sufficient bandwidth for wifi without subsampling? sir,where and when i can get this hardware? With a slightly beefier ADC, you could do the entire HF spectrum. Far more useful for people with the license to transmit. No offence, but not exactly impressive taking into account the maximum sample rate. If you want to do something unique, work on a wideband direct conversion sdr. I was going to do it, but i couldn't afford the direct conversion dacs. "No offence, but not exactly impressive taking into account the maximum sample rate. If you want to do something unique, work on a wideband direct conversion sdr. I was going to do it, but i couldn't afford the direct conversion dacs." Anyway, please take my money! This is awesome. I've been toying with making one of these for a while. I couldn't justify the time commitment, though. My hats off to you! In your final spec, please keep the low end frequency around 100MHz. This will be perfect for a 144MHz IF for microwave transverters! This is an excellent core for many different devices! With a transceiver like this you can potentially build things like a network analyzer, radar, NMR spectrometer, nonlinear junction detector, dielectric spectroscope, and many many other toys. Please consider some way to include the frequencies below 100 MHz, even if it would require some additional effort by the end-user, for the purposes above. Would this fit into the second drive bay of a mac mini? I could see that connected to a Yaesu FT857. I love this. I would buy 4 of them. Do you plan on selling them built? Anonymous: 20 Msps is barely enough for some of the Wi-Fi modulations. We're not sure yet if we'll hit that goal, but we should be able to get to 15 Msps at least. Steve Meuse, Shaddack: Actually it looks like our official low end frequency for Jawbreaker will be 30 MHz, and unofficially I've had some success down to 10 MHz. Anonymous: I don't think we'll be fitting things inside a Mac Mini. Jawbreaker is about 17 square inches. Thanks for all your kind words of support! does "Yes, it will work with a laptop." mean it will be mini-PCI form factor with standard wifi antenna connectors for an internal laptop install ? or will we be the guys at the coffee shop with all the weird wires running to all the weird boxes that everyone is starting at ? Anonymous: It will not be mini-PCI. Expect stares. The HackRF board and its goals seem quite interesting for sure. However, I am wondering why an 8-bit resolution was selected as a goal vice trying to shoot for say 16-bit or greater resolution? Whilst it seems obvious that the HackRF board will have many potential capabilities, will it be able to function as an Ubertooth One as well or will this functionality not really be possible with a finalized variant of the HackRF board? We're using 8 bit samples primarily to save cost. If you have any doubts as the usefulness of 8 bit samples, take a look at the amazing things people have done with rtl-sdr. HackRF will not function as an Ubertooth exactly, but it could be used for similar applications. The reason we kept libbtbb as a separate library is so that we can revive gr-bluetooth for Bluetooth baseband applications using SDR platforms like HackRF in addition to using simpler platforms like Ubertooth One. I expect that Project Ubertooth will continue to be the easiest to use, lowest cost platform for identification of non-discoverable Bluetooth devices. gr-bluetooth is for what? Can you please redirect me to documentation for it? put this project on KICKSTARTER!!!!! $$$ to get production going. Looks like a nice device. I could have fun listening to various radio frequencies with it. My only concern about it is if it can really transmit over the range of frequencies it can listen to. I'm sure there are legal issues putting a transmitter in the hands of people not licensed to operate transmitters in some of the frequency ranges of this device. If it's output power is low enough, then maybe it won't be an issue. Its a good idea but people are missing the point with SDRs. Legasy modulation is predominantly used on HF and there are many off the shelf HDKs and commercial hardware can be modded for BT, WIFI ect. What needs to be done for this spectrum coverage is D-Star, QAM, GSM, TETRA, DECT and various others. Most modulations in this spectrum coverage are digital. But there seams to be little support for them. Back in the 90`s i used to entertain myself with ETACS but have not been able to do so with GSM that would be good. And do digital modes as i say BUT no TX the CAA for example will throw the book at you you will never be able to import anything that can TX in the air band. Ofcom in the the UK will be realy funny about that you`d never get it to market. Congratulations on making a nightmare for the FCC and a hand tool for terrorists everywhere. An ExpressCard (serial PCMCIA) form-factor would be the best, IMO. Great works, guys, keep it up! Have you any news about the project or the first PROTOTYPE that we can buy ? 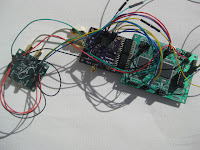 I am final year student of telecommunication engineering, I want to develop a first prototype of this project on an FPGA, Do you know if there's already something similar? is it possible? Ramssel: There are many SDR implementations that use FPGAs. In fact, before rtl-sdr and HackRF, every wideband SDR platform I can think of used an FPGA. Hi, how i can generate dvb-t signal in a simple and low cost manner? I want to test RF TV, then i want inject a video stream to RF TV for a DVB-T signal. Is just to teste RF TV, nothing more. Ran the HackRF as a beacon transmitter on 1296.1 MHz which is one of our Ham Bands. The beacon was heard at S5 (about 40 dB out of the noise) at 23 Km distance !! Still learning here, but the box has some interesting implications for Amateur Radio for sure. Hi! I'm from Italy, I own a Hackrf and I'm very satisfact with that piece of hardware!!! Any suggestions? Maybe I'm missing some options in hackrf_transfer? Usually,buying a used car is a much better option than purchasing.